The summer of 2017, was a summer of abundance magicks. 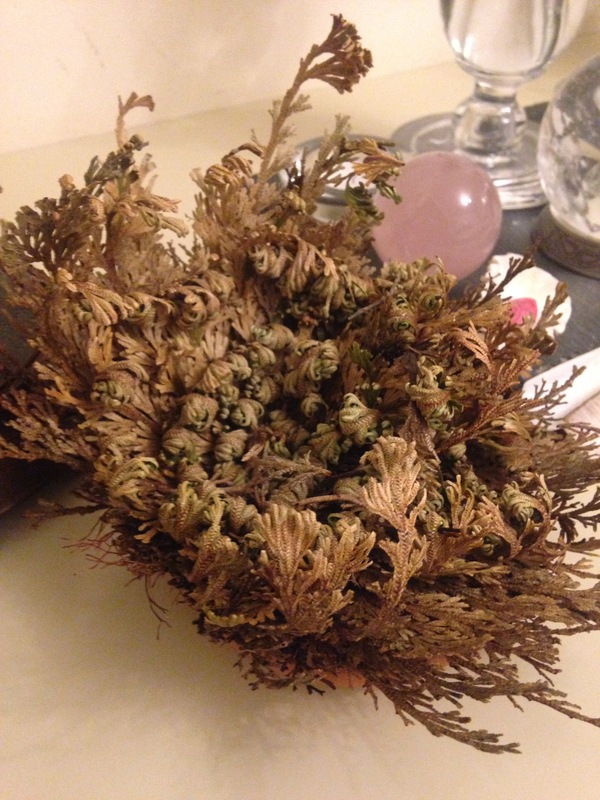 Have you heard of the Rose of Jericho? It is seemingly dead when it arrives, but then when you put it in water it resurrects beautifully green with a greenwood smell. I placed a small crystal inside it, let the plant dry out, then allowed it to be reborn over the course of the full moon. Being hematite I intended this crystal to be used to draw in abundance. The altar I set up inside celebrated bees and frogs, both being symbols of abundance. I included a money frog, and my animal cards, along with crystals and little treasures I had collected for the purpose. I would add these things, along with the crystal, to a small bag I bought for the purpose. Believe it or not, this little fellow was found the next morning trapped in our guinea pig run! Of course, I rescued him. Now winter is well and truly here, it’s time to look back and reminisce – and I can confirm the abundance spell worked, but like all my magick, in unexpected ways! Rather than bringing money my way, I ended up with friends and teachers. And a new lease of life. Which has, to be honest, lead to a far more abundant life than I could ever have imagined, and a new year full of promise.